Though it is not a requirement, providing a feeding station and establishing a specific area for feeding has many advantages over feeding out in the open. Feeding stations protect the food from the elements by raising it off of the ground and/or shielding it with a roof, and they can be designed to provide the cats with shelter while eating. An established feeding area also helps with Trap-Neuter-Return (TNR) efforts, since cats will arrive to eat at the same place every day, making it easy to know where to trap. Location of the feeding stations is important. Food should be situated away from high traffic areas and not too close to either the cats’ winter shelters or the place where they eliminate. Some caretakers create a feeding station in their garage, shed, or carport if the colony is near their home. When colonies live at a workplace environment, school campus, or on private property that you do not own or control, you must negotiate a mutually agreeable feeding location with the owner or management. Feeding on someone else’s property without permission can lead to conflict and may create resentment that jeopardizes the cats’ safety. It is well worth the effort to track down a property owner and obtain permission to feed the cats on property that is not yours. Never feed in or around winter shelters because it can lead to fights among cats and a dominant cat may prevent lower-ranking cats from using shelters. It can also attract wildlife to the shelters. Never leave food near the nest of a nursing mother — this could attract other cats or predators to the kittens. The mother cat will prefer to leave her kittens at a safe distance from the other cats while she comes to eat at the feeding station. She will move her nest if she feels there is too much activity near the nest. A visible feeding station placed with the property owner’s permission will make a TNR program appear more legitimate — it is a clear reminder that someone is caring for and about the cats. A feeding station can be used to educate others in the neighborhood. Many caretakers post signs providing information about how to contribute or volunteer, and explaining that the cats are fed on a schedule (so people should not leave food). On the other hand, you may need to keep a low profile for your colony if there are people in the area who pose a threat to the cats or are inclined to complain about the cats. In that case, a camouflaged feeding station will hide where the cats eat, make the cats’ presence less obvious, and make colony management easier for the caretaker. Feeding stations come in all shapes and sizes and they can be simple or elaborate. You can use a sheltered spot such as a hole in a wall; repurpose a plastic storage bin by removing the lid and turning the bin on its side; or build a canopy to cover the food. Suitable feeding stations can easily be fashioned using basic carpentry skills or by repurposing household items. 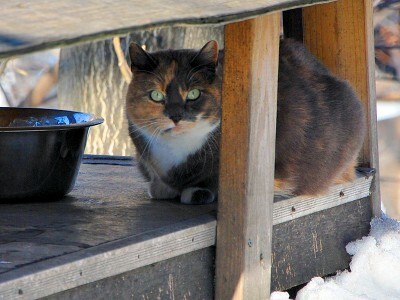 An example of a durable purpose-built feeding station is the Alley Cat Allies feeding station (plans for building this shelter are available on their website). It is essential to keep the feeding location neat and clean, both for the health of the cats and for good community relations. Disposable plates may be convenient, but when empty they can blow around and cause complaints about garbage. Remember, complaints regarding the feeding area are usually directed mainly at the cats, not the human caretakers. Heavier reusable food bowls will stay in place but they do require cleaning. If it is not practical to wash food bowls daily, bring paper towels, a scrub brush, and extra water to clean the bowls. Removing food bowls between meals can enhance community relations. Besides any containers you use for the cats, there may be litter and trash in your feeding area. Removing all of this daily or weekly will help to keep the feeding station sanitary and unobtrusive. It is important to pick up the trash in the area, even if it is garbage you did not create. This helps to avoid possible health code or sanitation violations, maintain positive relations with the local residents, and keep the area sanitary for the cats. The Out of the Cage! blog article, Slugs and Ants and Flies, Oh My!, offers simple and practical ways to keep your feral cat feeding stations insect-free. The best way to deter wildlife is to avoid overfeeding. Excess food attracts rodents, raccoons, skunks, and other wildlife. Because some of these animals come out at night, you may need to feed during the day and remove all uneaten food after dark. Adjust your feeding routine to address the specific wildlife at your feeding site.